After a four-year absence from Orlando's Citrus Bowl Stadium, the Drum Corps International World Championship returned for its most recent visit to the land of Disney to witness Blue Devils do something the corps did there in 1996 and 1997 — win. It was the corps' 11th Drum Corps International Championship, with "The Phenomenon of Cool" cooling the heels of The Cavaliers, who were trying to spin their way to DCI's first World Class four-peat. Just 0.15 under "Spin Cycle, The Cadets were enjoying their "Favorite Things" from their past and that of Santa Clara Vanguard and the Madison Scouts. Phantom Regiment's "Harmonic Journey" was for many the show of the year, introducing body sculpturing to the corps and some brilliant drill maneuvers that were also new to the organization. Santa Clara Vanguard's "Pathways" led the viewer through countless shifting hallways in the drill, and Boston Crusaders gave us another spin on "Malegue?±a" to compare to that of Cadets'. Further down, it was the last year we witnessed Magic of Orlando in the Finals. Carolina Crown's 10th place "Bell-issimo" was conceived as a production focusing on how bells have been used worldwide for centuries to announce both joyful celebrations and times of sorrow and reverence. With almost a full minute of a ball-peen hammer hitting a large cast bell and a variety of metallic keyboard sounds accompanying the percussion, "Mass" from H. Owen Reed's 1948 concert band masterpiece, "La Fiesta Mexicana," called the faithful to worship before the first massive hit of the brass announced the gathering of the reverent. The repetitive pattern of three bell tolls spread evenly over two bell tolls of a different pitch gave the sense of multiple bells ringing across the Mexican village. 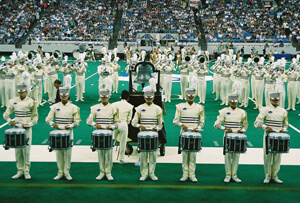 Performance excerpt of 2003 Carolina Crown. "Earth," the first movement from Philip Sparke's 1999 "Symphony No. 1," was a jubilantly happy work that, according to the corps' press release, was said to "open wide the view from a single village to that of all of humanity." From eight files, the brass players poured out into a block formation of a giant bell, with the drums serving as the yoke from which the bell hangs, as the mallet keyboards repeated a pealing bell motif for several measures. David Gillingham's "Stained Glass I," (titled "Foyers" by the composer) was originally written for 12 percussionists, exploring the colors of stained glass. Utilized in its purely percussion form, members of the horn line molded a number of outlines of varying sizes of hand bells. Claude Debussy's brooding "The Engulfed Cathedral," (often translated as "The Sunken Cathedral") originally was an impressionistic prelude for solo piano, written 93 years prior to Crown's performance. The piece is based on an ancient myth of an underwater cathedral that rises from the sea and offers up sounds of bells chiming and an organ playing. Gillingham's "Stained Glass II" (originally titled "Cathedrals") also remained in its original percussion-only form, providing the show three extended percussion features. "Carol of the Bells," written by Ukrainian composer Mykola Leontovych in 1904, led into John Wasson's "Bellsong Fantasy," originally written in 1996 for chorus, hand bells, organ and orchestra. The closer prominently incorporated the four-note repetitive melody that is most famous in "Carol of the Bells." The show ended with the full corps in a giant bell form that spanned 70 yards, ringing out one last proclamation of ecstasy and reverence across the field. For this week only, you can save on the DVD that contains this complete Carolina Crown performance, along with all finalists from the 2003 DCI World Championships. Buy the 2003 World Championship DVD set. (Available this week only for $36. Regular price: $45.) Discount DVD offer ends Monday, June 10 at 8:30 a.m. ET.